Everybody, meet my new friend Chef Kelly English from Restaurant Iris. 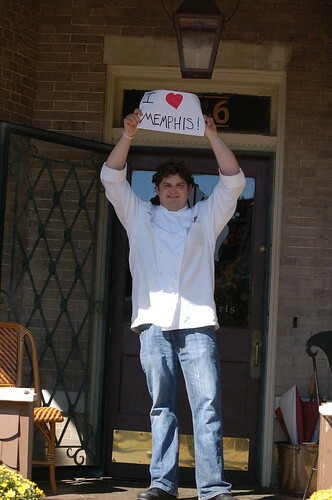 When I walked into the restaurant kitchen to find him on Friday so I could take his I Love Memphis picture, he was grinning and chopping up some lamb with a cleaver. On Friday, Chef Kelly debuted a new fall menu that features all kinds of delicious-sounding dinners. “Hand dived scallops, local peas, allen benton’s bacon, tomato, tarragon and lemon”? Yes, please! “Grilled cheese of cold smoked salmon, brie, olive, and creole mustard”? Where do I sign up? The restaurant is located in an adorable Midtown house just east of Overton Square. They’re open for dinner Tuesday – Saturday until 10 p.m. For those of you that really want to try Iris but can’t quite swing dinner, check out Sunday brunch, every Sunday from 11 a.m. – 3 p.m.